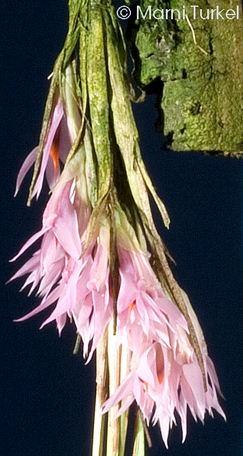 Dendrobium violaceum subsp. cyperifolium outcross #377 ('A' x 'Judy Carney') (approximately 25 seedlings per flask). The Species: The plant is pendant, the leaves very narrow and distinctly different than the plant of the regular form of D. violaceum. To me the flowers are indistinguishable from the standard form except that they are pendant and are much more visible on this form than on the other. The plant is 15" from the base of a growth to the tip of the leaves. I don't have an image of the pollen parent which was a clone that I remember as having a red hue and was from the importation with the same growth habit. Culture: I grow it mounted in 56F minimum night temperatures with almost daily watering with dilute fertilizer in moderatley bright light.